This custom logo witz case with pro sunscreen & lip balm contains a natural flavored lip balm. Includes 1 oz. SPF 50, 1 oz. SPF 30 Sunscreen Stick and SPF 15 Lip Balm. Show your valuable customers how much you care for their health and wellness with a sun protection kit this time! The Witz case with pro sunscreen & lip balm is a high quality multi-use case that can store your essentials or the skin care products at the next outing. Ideal for picnics and tours, this case is made from water-resistant, crush resistant ABS plastic and features an O-ring to save your things from dust and other barriers. It also comes with a carabineer and lanyard for ease of use. 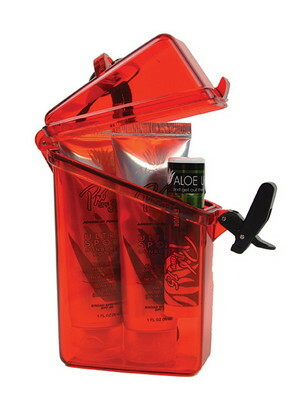 The kit includes Aloe Up sunscreen lotions and lip balm to offer you complete sun protection during your outdoor action. This case is available in attractive color options and you can easily customize it to your brand by inserting your corporate logo and marketing message to promote your brand at various places.